Colliding in landslides, rasped in the flow of glaciers, tumbled by fast moving streams, battered by wind and rain, by frost and thaw, split by the roots of plants taking hold in small cracks, rocks break into the shape of hearts. True, they also break into the shapes of buffalo and wolves, of perfect spheres, of birds and dragons and the shape of the state of Montana, but hearts seem the most common. The variety of minerals that come together to build rock, and the particular forms the mineral crystals take, determine whether the rock is sedimentary, metamorphic or igneous. But every type of rock breaks into hearts as the minerals in each, breaking along crystallographic planes, influence the shape of the stone. The breaking is called cleavage. My cleavage and my heart are pretty close together, although I think that has nothing to do with rocks. English is a peculiar language. Has Castaneda stayed with anyone else as long as he’s stayed with me? There’s not a path I walk that, upon seeing heart-shaped stones or leaves lying in the path, I don’t consciously think, I’m following the path with heart. I interpret that to mean keep going; you’re going right; you’re on the good path. It would seem, though, that most paths must be good since I find heart stones everywhere-- on trails, on stream banks, on the tops of mountains, whichever way I go, whether I take this fork or the other. I suppose the meaning of free choice is the selection of the path. (For the record, I usually choose the left fork.) Leaving the leaves, I pick up every stone, each a personal gift from the path. 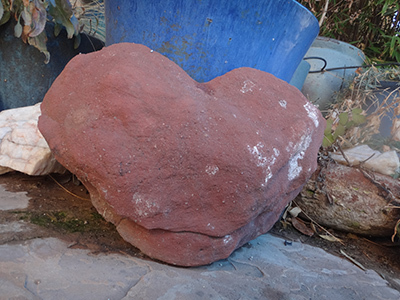 One stone, not necessarily heart-shaped, is particularly identified with the heart. Called the Heart Stone, rose quartz is considered a talisman of relationship. It is (theoretically) effective in attracting new love, romance and intimacy. According to information I found on the internet, it was probably used as a love token as early as 600 B.C. How does someone know that? Has rose quartz been unearthed in archeology digs between two skeletons holding hands? 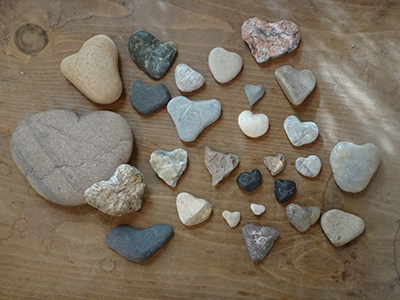 Stones as love tokens are not only a part of human life. Penguins bring them to their mates, dropping them at their feet as deep and precious gifts. Those penguins with the most stones lining their nests are the richest ones, or, perhaps, the most loved ones. Their nests are always in the best places. But I recently saw a television commercial in which a penguin one-ups the other penguin inamoratos by giving his love a diamond. True, it’s a rock, but I hate to think of all the other penguins thinking their rocks aren’t good enough. 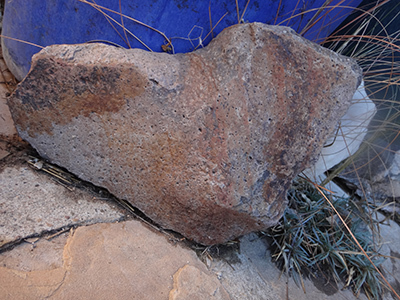 Stones, for all the chaos geology throws at them, are symbols of solidity. We call a person who is steadfast and reliable “solid as a rock.” But rocks fracture and change and move with the flow of geology. Is that what solidity is? The ability to move with the course of nature? Does the fact that rocks so often fracture into hearts mean a person who is “solid as a rock” has great heart? And, if stones break into hearts, how do hearts break?